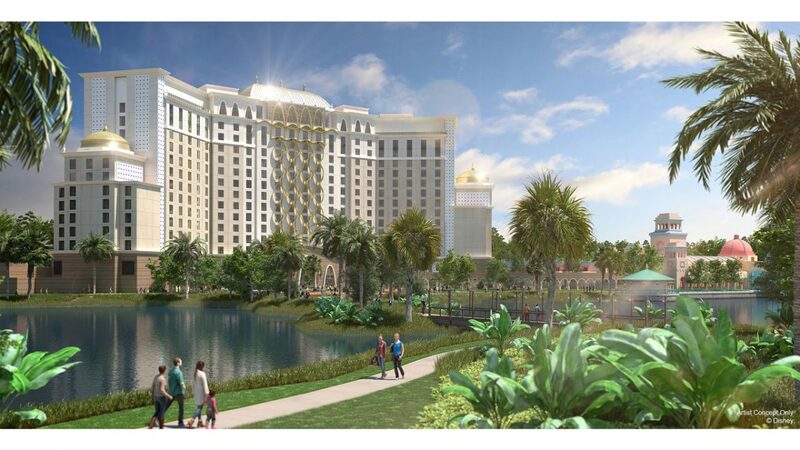 When completed, the Gran Destino Tower will be part of the reimagining of Disney’s Coronado Springs Resort. This transformation is inspired by the adventurous spirit of great Spanish explorers and historic innovative Spanish artists, writers and architects. Guests can look forward to new dining experiences as part of the reimagining. Three Bridges Bar & Grill will be located on an island in the middle of the resort’s 14-acre lake, Lago Dorado. Courtyards adjacent to the restaurant offer private-event options, and the entire area is accessible via convenient walkways stretching across the lake. Additionally, a unique rooftop table service restaurant, Toledo – Tapas, Steak & Seafood, will open as part of Gran Destino Tower. The new dining establishment – featuring beautiful views of Walt Disney World Resort – will offer indoor dining and a lounge with indoor and outdoor seating. Stay tuned to the Disney Parks Blog for updates on when reservations become available for this exciting new dining location. The new tower, once completed, will be the main entrance for Disney’s Coronado Springs and will add 545 new guest rooms (including 50 suites!) as well as a gorgeous two-story lobby. The 1,800-plus existing rooms at the resort are already fully updated with new fixtures, furnishings and lighting. Visit the Walt Disney World website or call 407-W-Disney or your travel agent to book your reservation.